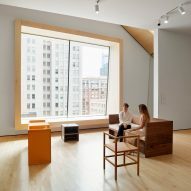 An exhibit of furniture by American artist Donald Judd is on display at the San Francisco Museum of Modern Art, accompanied by a guide with photographs of his New York and Marfa studios. 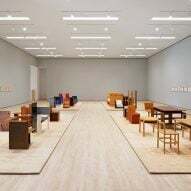 The Donald Judd: Specific Furniture exhibition at SFMOMA showcases a substantial collection of Judd's chairs, desks, beds, and tables, in company with other modernist pieces that he owned. 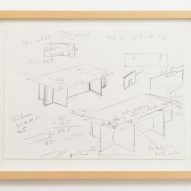 Living in New York City in the 1960s, Judd first practised painting and sculpture before moving onto furniture in 1971 – around the same time he relocated to Marfa, Texas, and opened a studio. 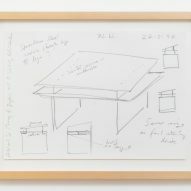 The exhibit brings together Judd's works and drawings, as well as examples of well-known furniture pieces that he owned, as an attempt to place the artist in a broader context of the modernism and minimalism movements. 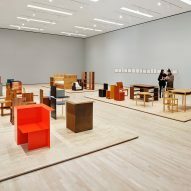 "Judd's designs emerged in response to what he saw as a lack of good, basic furniture," said a statement from SFMOMA. Many of his pieces are simple and pared-back, commonly featuring 90-degree angles, and red and black in colour. For materials, Judd often used rough, lumberyard-cut pine or birch plywood, while other pieces feature aluminium and copper. Included in the exhibition is an illustrated guide with photographs of his workplaces in New York City and Marfa. 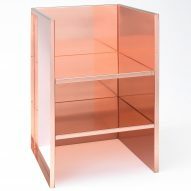 In addition to making furniture, Judd also collected iconic pieces himself. 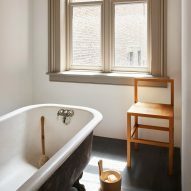 Classic designs by Alvar Aalto, Ludwig Mies van der Rohe, Gerrit Rietveld, Rudolph M Schindler, and Gustav Stickley were among his collection. "Donald Judd: Specific Furniture presents Judd's work alongside a selection of important pieces that he collected and lived with, in his homes and studios, placing Judd firmly within the design canon and opening a broader lens on his creative practice and environment," said Joseph Becker, SFMOMA's associate curator of architecture and design. One photograph shows Judd's Marfa studio, which features a frame table he made in 1989 alongside a MR Side Chair by Mies van der Rohe. The room is also furnished with Rietveld's Red Blue Chair in a corner, next toAalto's Stool 60 and Karl Trabert's Desk Lamp. In another photo of the Marfa workspace, a large black drafting table and Open Side Chair 84 – both designed by Judd – can be seen beside Rietveld's Zig-Zag Chair. The Open Side Chair 84 comes from a series of box-like metal furniture, which was produced by Swiss firm Lehni. The designs are still produced in Switzerland, with a variety of the powder-coated aluminium chairs and tables available in the range. Judd's studio at 101 Spring Street in New York's Soho – which was restored in 2013 – is also presented in photographs. In a long room lined with windows and golden wooden floors, pieces include the artist's Fourth Floor Table 19 and Fourth Floor Low Table 18 – both made in 1981 – as well as Serving Table 64 and Cart 62 from 1985. Another dimly lit room at 101 Spring Street features library shelves by Judd, with Aalto's Stool 60, Chairs 21, and Table 70. The exhibit title comes from Judd's 1964 writing, Specific Objects, in which he theorised the limitations of painting and sculpture, and the potential for more three-dimensional art. In the text, he referenced the works of Mark Rothko, Yves Klein, Jackson Pollock, Frank Stella among dozens of others. 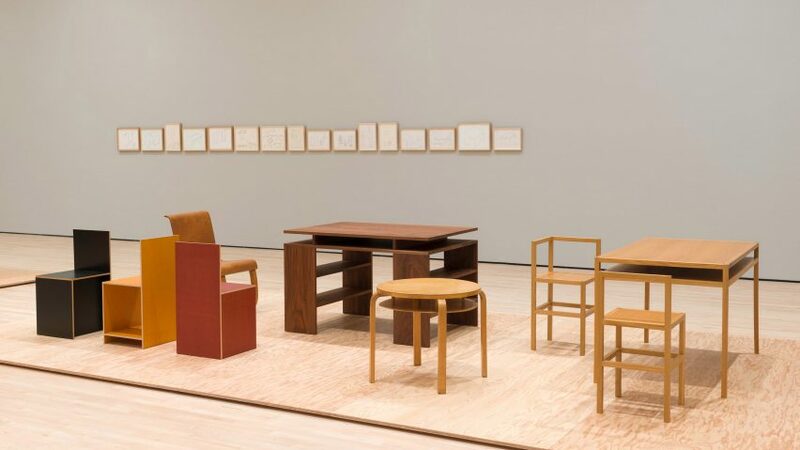 "This exhibition looks beyond his noted sculptures, which he referred to as 'specific objects', and examines his furniture design as a parallel practice that began in the 1960s and deepened throughout his career," said a statement from SFMOMA. 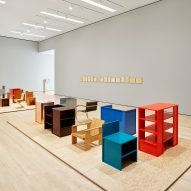 Newly fabricated Judd furniture pieces that visitors can touch and use are placed outside the exhibition, which is on display at SFMOMA from 14 July until 4 November 2018. Photography is by Katherine Du Tiel unless otherwise stated.